I am getting older. 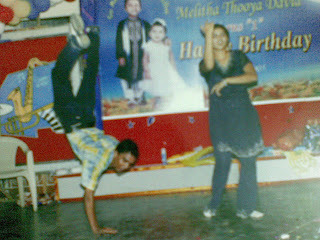 Considering the flexibility that I had a few years back, I feel sad that I am not able to do the same stuff these days. I was scanning through an Old photo album.It was the summer of 2005.One picture caught my attention.That one hand stand of mine. I wanted to post this dance step in my blog. I tried the same dance pose now. But I could not do it anymore. How can a person know that he/she is getting old? I wonder the same thing a lot nowadays!!! of course u r getting older chriz! I can tell you as a fitness trainer that more than flexibility, it is strength that is required to do this. Just do few push ups everyday and you will still be able to do this. And for push ups, you don't require to join gym, hire a trainer, buy expensive equipment, have an hour to workout...nothing. Just do push ups everyday. and we will come to know that when u we cant perform those stunts anymore..!! BUT Do u have white hair to worry? im sure if do this, you can keep fit meaning young in your words!!! also depends on your attitude. nope. not et all....who sayz so? dei athula ethavathu graphics erukka enna? you are losing the war mate. but keep on fighting till you dont fall. BTW your posts are growing funny day by day and that is for sure. Great picture chriz...but I am sure if you'll have a regular exercise regime, you'll be able to do the step again, its just a 3 year old thing..so I am sure.. I guess u need to divide the no of gray hair by total hair if u get 2/3 or more as the answer..then u surely are..
there r many things in life that I CUD do before but not anymore. yes, it mebbe cos Im getting older...not all that much physically but emotionally...Im quite tired. **How can a person know that he/she is getting old? when u know alot abt life and u know that nothing can be done about many things. Physcialy you can say you are old to do that stunt..even if you practise that you can do it..well mentaly??!! Age is what you think of yourself, not on numbers. sagging of skin,greying of hair and much more matured talks and thoughts are a few ways that indicates aging. Hey,but it really doesnt matter,yaar. i guess am old then... do u ask people the same question too? you fart with a creak??? whoa! i could do the cart wheel as a kid but was not able to do so when college but now i can (after a few months of getting back in shape and working - aerobics, swimming) - not easy but i can be done. i'm only as a old as i think.